This year we have a little extra merriment during Advent. 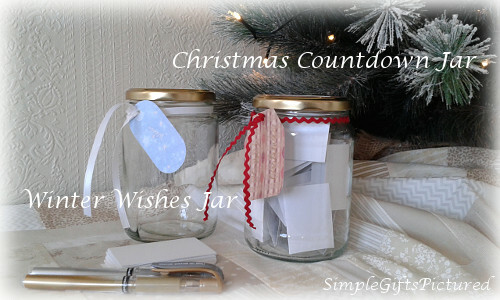 Something I made just before Advent began... A Christmas Countdown Jar! And a Winter Wishes Jar! The Christmas Countdown Jar is filled with folded card stock tags, and on each is written a fun activity to enjoy every day during Advent, as we countdown to the JOY of Christmas. The Winter Wishes Jar began empty. Beside it sits a stack of blank card stock tags, and metallic pens. During the month of December, TJ and I are writing down wishes--little things, and big things--onto each card stock square, folding them up and putting them in the jar. After the New Year we will open the jar, unfold the wishes, and see if we can make some of the wishes and dreams come true in 2018! Note: I used pre-cut card stock tags, as well as papers from a winter-themed paper block, both from a craft store, for both jar projects. Card stock paper can be used and cut up to create one's own tags in any size desired. 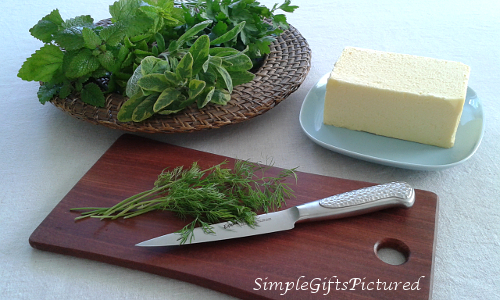 I liked the ease of using the pre-cut tags. And 24 of them just fit my jars. For the Christmas Countdown Jar, I took 24 card stock tags and wrote on each tag a fun activity to do for every single day of Advent, using a metallic pen. Then I folded the tags in half, placing them in the jar. I then cut out a circle of decorative paper for the lid of the jar, using a tape roll to adhere it to the lid. With some leftover decorative paper, I made a tag to match, wrote "Christmas Countdown" in metallic pen on the tag, and used ribbon/rick rack to tie it to jar. Similarly for the Winter Wishes Jar, I cut a circle of decorative paper, adhering it to the lid of the jar. 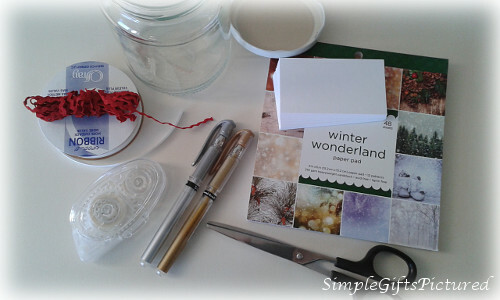 And made a little tag, tied to the jar with ribbon--Winter Wishes written on it in metallic pen. By the Winter Wishes Jar sits a little stack of card stock tags, ready for winter wishes to be written on them, and placed in the jar. At the New Year the jar will be opened to reveal all the wishes! I cannot claim this project as my own, as I was greatly inspired by the many ideas found online for winter activities, December countdowns, Advent calendars, etc. I just used what I had on hand from my little stash of creative supplies. I used to do a lot more with paper crafting and card making, but not so much these days, as it can be an expensive hobby. Still, I had a few things, and just enough to create these jars. The jar decorations can be kept rather simple as I have done, or dressed up even more. Lots of room for interpretation and expansion on this idea--great imagination exerciser! This can be a very cost-effective solution for an Advent calendar, especially if reusing some jars from the kitchen, which I have done, as well as minimal supplies. 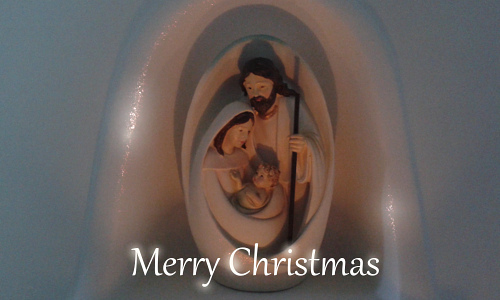 There are lots of things to do for fun during Advent that don't have to cost very much. Some frugal ideas on our own cards... We have everything from hot cocoa by the fire, twilight winter walk (free! ), writing letters to Santa --yes! ;) --and much more to look forward to during our Christmas Countdown. this is just adorable! it makes me smile. what a darling idea! I am going to tell my Husband about that!!! LOVE it!!! and you made it so pretty and simple, just wonderful! :) lots of love to you! and a big HUG! Wow, I love your ideas. Your jars are so cute. 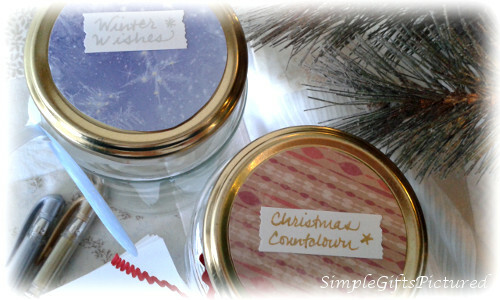 I like the idea of Christmas Count down jar and Winter Wishes jar. Thanks for including the instructions. I may not get to this this year but perhaps next year. It looks so fun. Sending loving thoughts and hugs our way sweet one! What a very clever idea. After Christmas you will have to share some of the ideas you two came up with. Will do, Marilyn! Both of these jars have been a lot of fun so far... and it's early days, really! I've been wanting to something like these--some kind of grown-up Advent calendar--for ages. 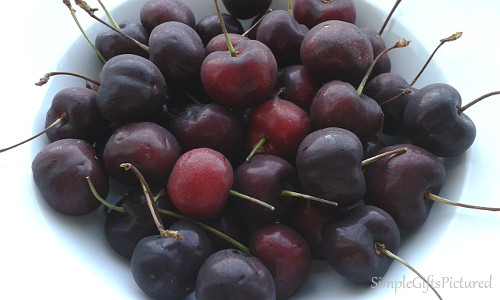 Fun, inexpensive, not too many calories, etc... LOL!